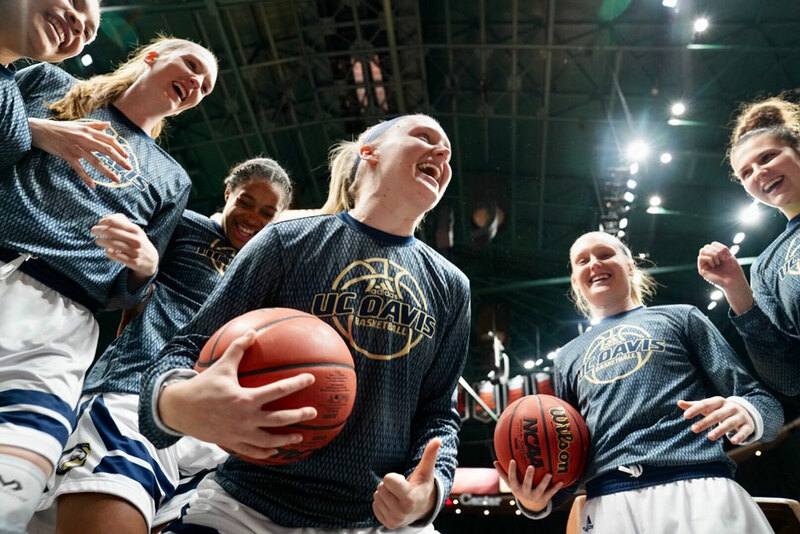 WHAT: UC Davis Aggies (25-6) vs. Stanford Cardinal (28-4), 2:30 p.m. Saturday (March 23). WHERE: Maples Pavilion, Stanford University. Ticket and bus information. TV AND LIVESTREAM: ESPN2 and WatchESPN.com. RADIO: KDVS 90.3 FM. The Aggies entered the conference tournament as the No. 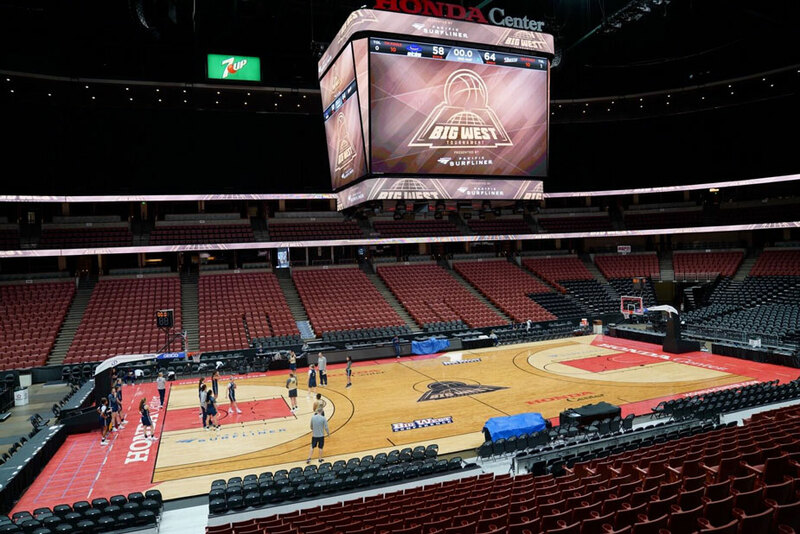 1 seed (by virtue of winning the regular-season title with a 15-1 record), advancing directly to the semifinals in Anaheim’s Honda Center, where the women are pictured during a shoot-around. Twins Karley and Kourtney Eaton, each a senior psychology major, each holding a ball, gather with their teammates before their semifinal game against UC Irvine, last Friday, March 15. 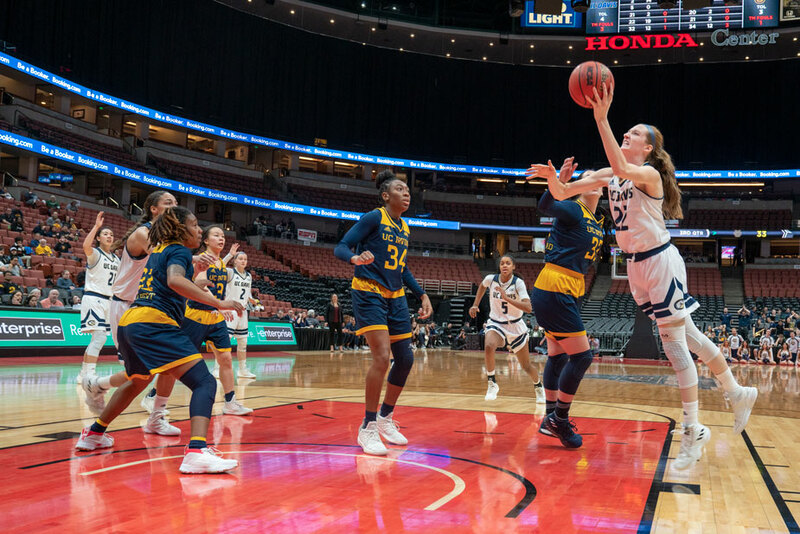 Morgan Bertsch, Big West Conference player of the year, finds an opening against UC Irvine. Bertsch, senior biomedical engineering major, would be named to the all-tournament team, along with Cierra Hall, sophomore cell biology major; and Bertsch also would be named the tournament’s most valuable player. 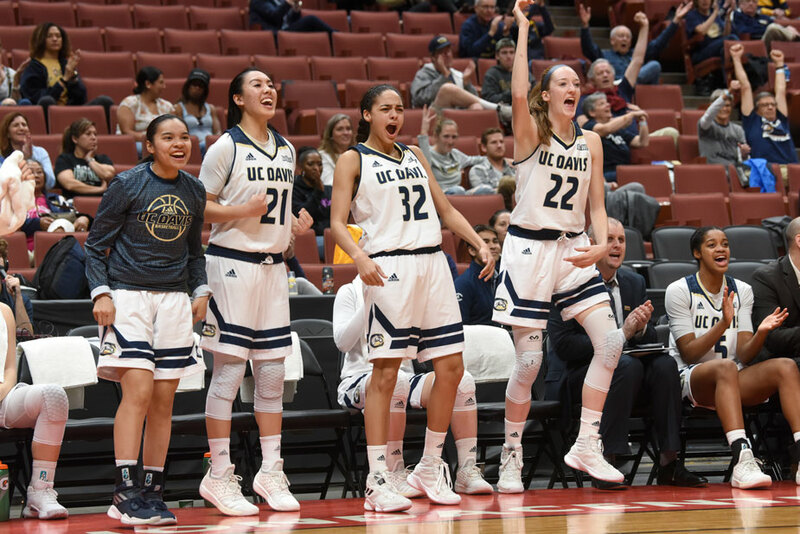 ... and from the bench, as UC Davis rolls to an 82-50 win over UC Irvine. 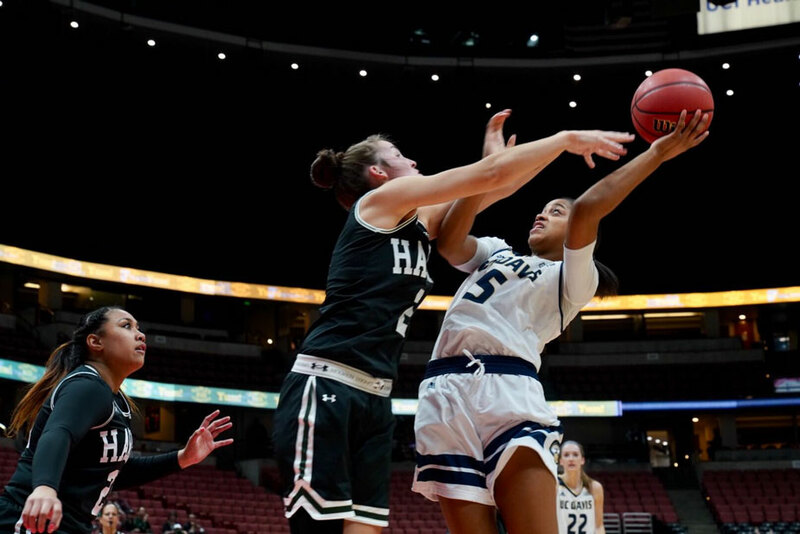 The next day, Saturday, March 16, in the Big West Conference Tournament final, junior communication major Nina Bessolo goes all out to get shot off. Hawaii, the tournament’s No. 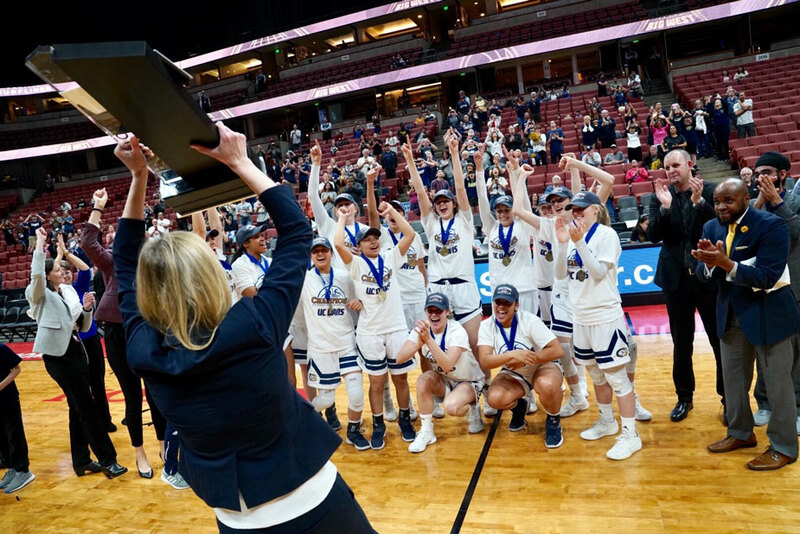 2 seed, was the last team to defeat the Aggies, way back on Jan. 12, before the Aggies embarked on a 15-game win streak leading to the tournament final. 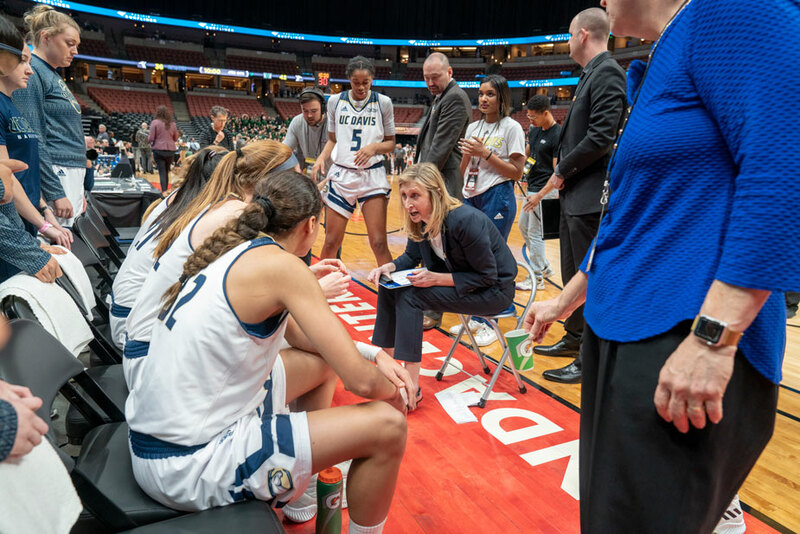 Jennifer Gross, Big West coach of the year three years in a row, 2016-19, huddles with her team during a timeout in the final — a game that saw the Aggies down by 17 in the third quarter. 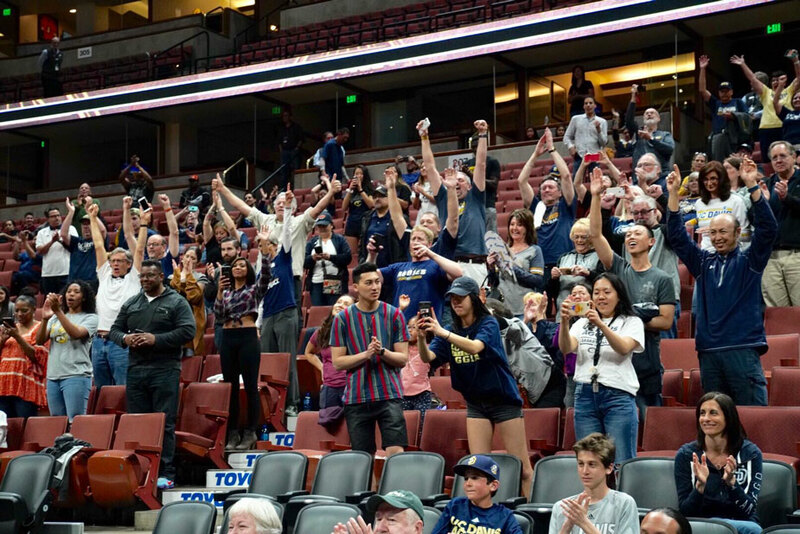 Epic comeback: UC Davis wins, 58-50. Coach Gross hoists the trophy as her team celebrates punching their ticket to the NCAA Tournament. 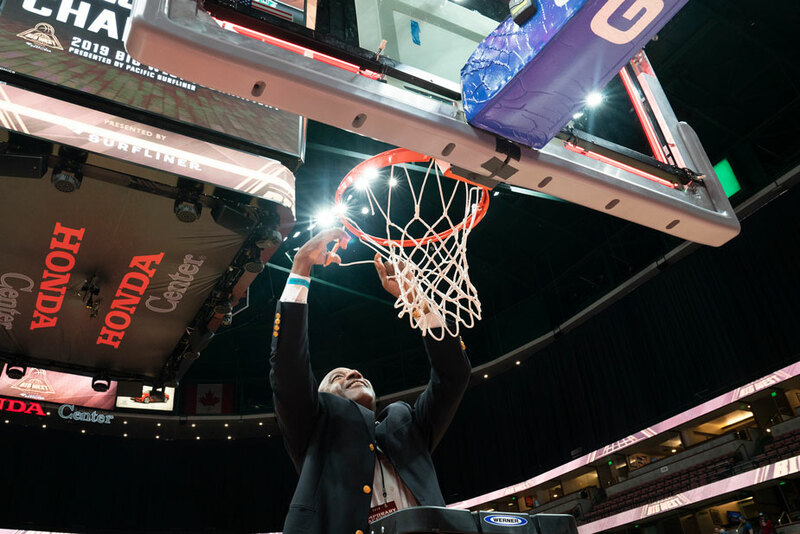 Chancellor Gary S. May has his turn with the scissors, joining the coach and players in the tradition of cutting down the net. Surprise! 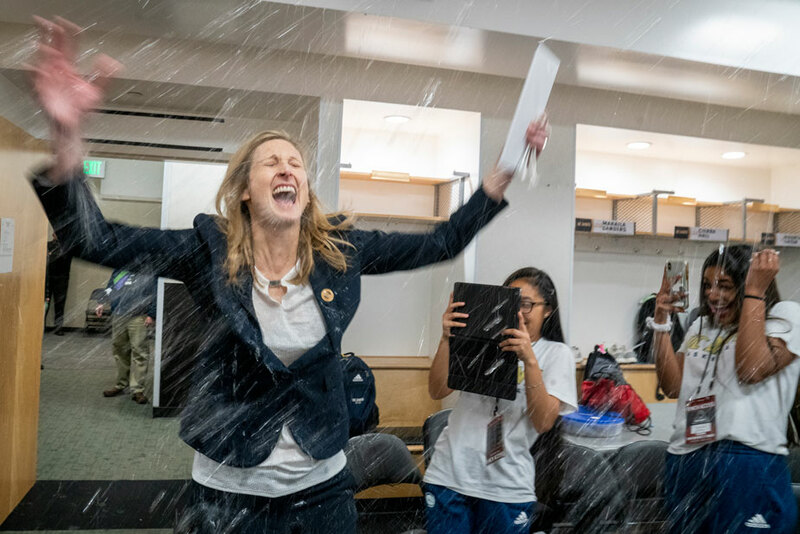 The Aggies spray water on their coach as she enters the locker room after a postgame news conference. 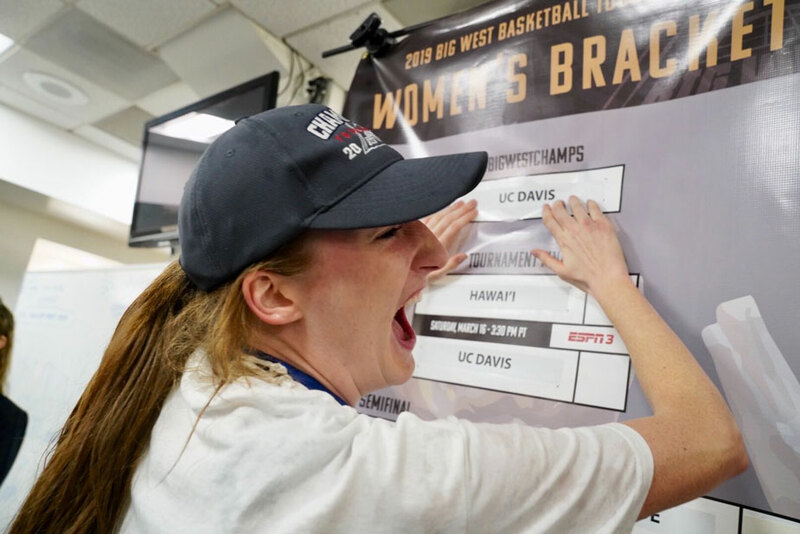 Bertsch pastes “UC Davis” at the top of the conference tournament bracket. 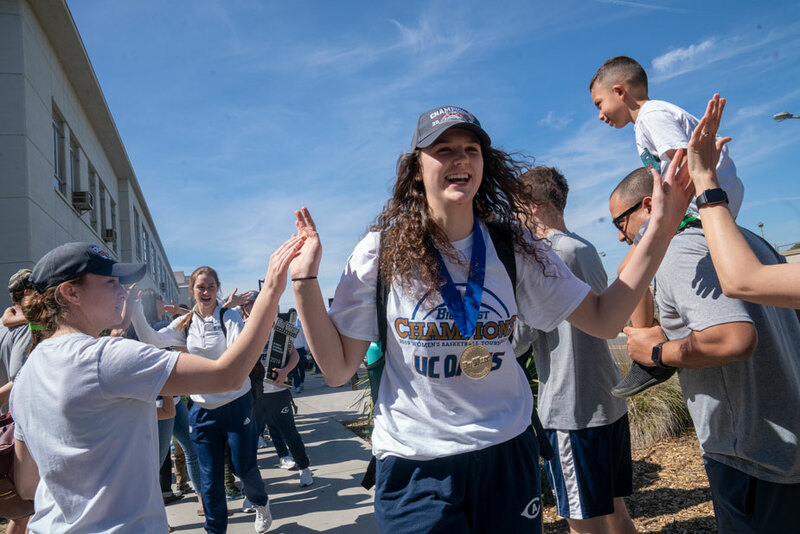 Triumphant return: Redshirt freshman Sage Stobbart, an undeclared major, sports her championship medal as the Aggies arrive back on campus, Sunday, March 17, welcomed by cheering fans, the Cal Aggie Marching Band-uh! and media. Photo gallery on the Intercollegiate Athletics website.